Luxurious Black and White Comforters for Your Bedroom! The Most Beautiful and Luxurious Black and White Comforters for Your Bedroom! OK, I love bright colors, but sometimes you want a neutral base to make some elements of color pop up in your bedroom. Pair a black and white bedding with colorful pillows, or contrast your bedding and curtains, add a bright and lively (and comfy) rug… you get the idea! When you are looking for colors that can give your bedroom a modern accent you can’t go wrong with black and white comforters. These two neutral colors together will turn your bedroom into a warm cozy place you’ll be happy to retreat to every evening. **Click the picture to find out more. Here you will find a selection of the most elegant black and white comforter sets and bedding sets that will enhance the look of your bedroom while providing the very best in quality and comfort. 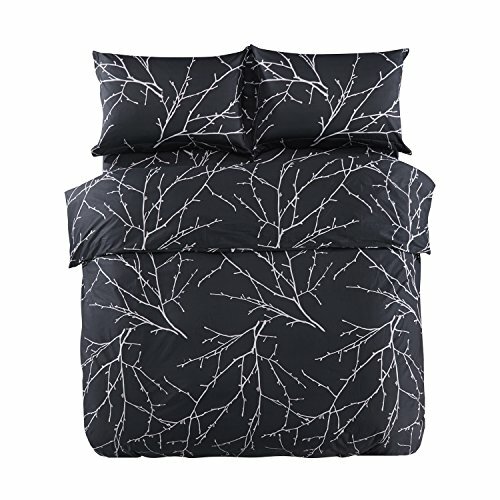 Gorgeous Black and White Comforter Set with a Fun Tree Branch Design! This is such a gorgeous 7-piece reversible black and white king comforter set in a fun tree branches design! It’s warm, it’s comfortable and look how amazing it makes a bedroom look! It also comes with the cool matching bedskirt and all the shams, besides all the cute pillows as well! What a gorgeous and very unique black and white comforter set! It’s almost like getting two comforters in one! You can get this amazing comforter set in twin, full, queen and also king size. Beautiful All Black Comforter Set! Of all comforter sets, all black comforters are the most elegant and stylish! They will transform any boring bedroom into a luxurious royalty bedroom! 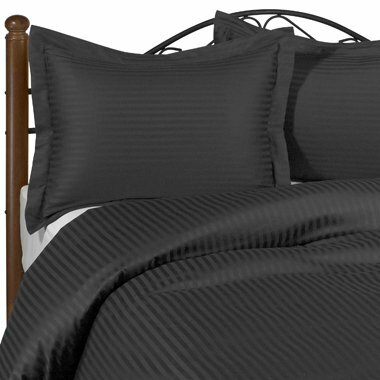 This is a stunning all black 3-piece comforter set in a gorgeous and very cool stylish stitch design! This is another beautiful, classy and very elegant Egyptian cotton all black duvet cover set in a soft striped damask pattern! It is made from 100% Egyptian cotton and it also comes with the beautiful black pillow shams and a white comforter enclosed. How stylish and fancy is it? How cozy and stylish does this black and white plush microsuede comforter set look? Makes you want to forget everything you are doing and go to bed right now, doesn’t it? Perfect for a cold winter night! I love the cute matching pillow shams too! This beautiful and fun black and white tree design bedding set is made of 100% cotton and features white branches design on a black background. Will light up your room! It’s stylish, cozy and definitely ‘chic’! It also includes the two fun shams! A soft and cozy vintage style that will bring a new look of modern sophistication to your bedroom decor! I love the floral design! This gorgeous 7-piece set includes the comforter, the two matching shams, two decorative pillows and two euro shams! Cute Black and White Floral Comforter Set! A sophisticated collection with elegant black flower embroidery on white background! The cute decorative oblong pillow has an intricate sun and rays design. Great gift idea for a young woman’s bedroom! This 7-piece set includes the comforter, bedskirt, two pillow shams and three decorative pillows. This is definitely one of the most fun black and white comforter sets from here! It has a beautiful and very modern large dots and polka-dot design! Can you spot all the dots? Absolutely adorable and great for a teenage girl’s bedroom! Hi Lorraine, thanks for visiting! Just click the pictures for more information. Thank you!